Lunch can be a stressful affair, what with lack of meal-prep time and the fact that your random leftovers from Tuesday often turn to mush in the office refrigerator. Consider us your desk-lunch savior. 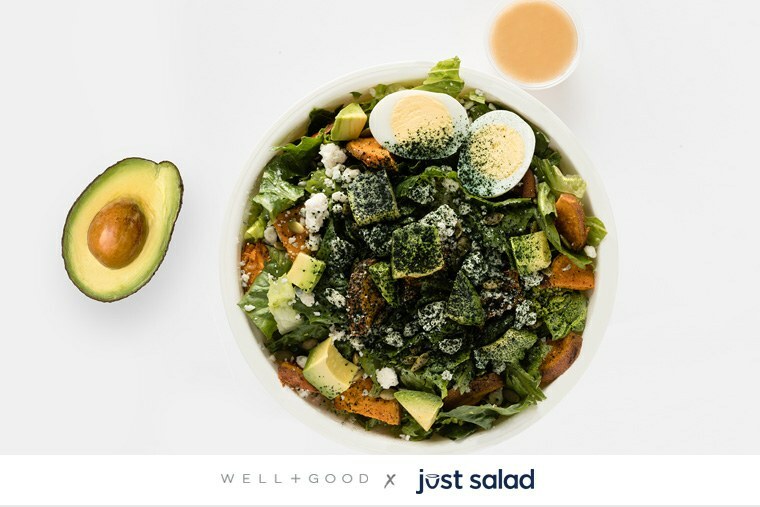 Introducing the Well+Good Cobb, our custom-created, superfood-packed dish now available at Just Salad through September. Why did we get into the salad game? Because we think wellness should be an easy 24/7 kind of thing—not something that requires endless hours in the kitchen and a degree in nutrition. Consider this our gift to you: A grab-and-go taste of Well+Good you can snag in a bowl. Together with Just Salad’s expert recipe pros, Well+Good editors dreamed up a dish with fresh romaine, hearty sweet potato, and cubes of avocado (naturally). Also: crunchy pumpkin seeds in place of croutons, protein-rich hard-boiled egg, and a dusting of detox-friendly spirulina. Lastly, the gluten-free mix is tossed with an apple cider vinegar dressing lightly sweetened with maple for the full W+G experience. PSA: Hit up your closest Just Salad spot (there’s more than 30 locations!) ASAP.